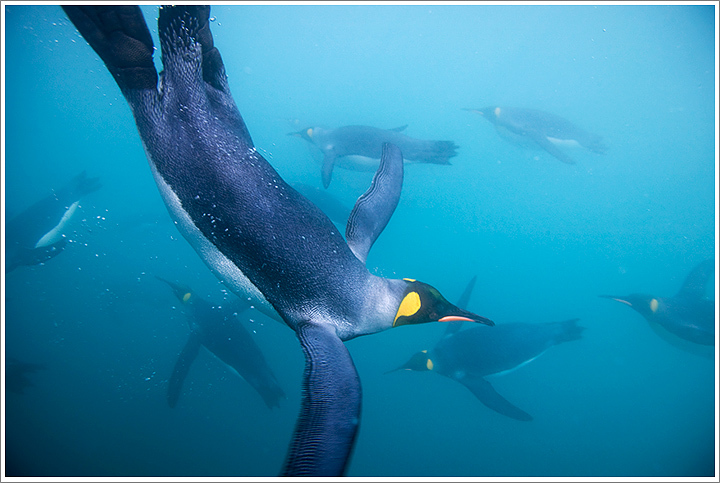 King Penguins swimming underwater near Right Whale Bay on South Georgia Island. Photographed March 11, 2006 with Canon EOS 1Ds and 16-35mm f/2.8 lens using a Seacam underwater housing. Exposure 1/320 at f/5.0 with ISO 200. This entry was posted on Tuesday, December 13th, 2011 at 7:32 am. It is filed under Underwater and tagged with Antarctica, King Penguin, Penguins, South Georgia Island, Underwater, Wildlife. You can follow any responses to this entry through the RSS 2.0 feed.